With this point of view, the architecture seems like lines and shapes. 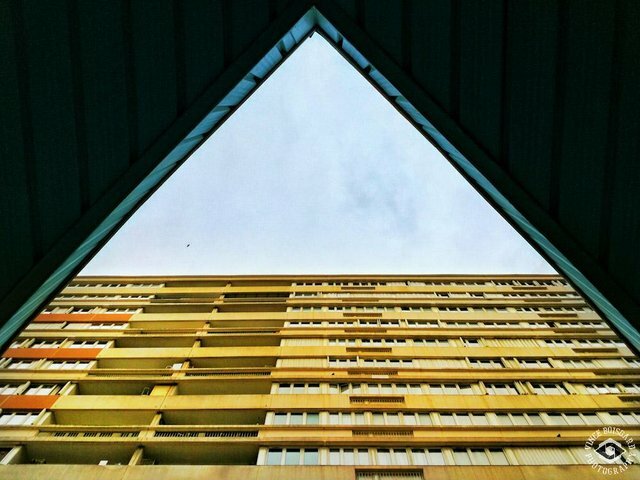 From the ground, looking up gives us different perspectives and allow us to open our mind to the abstract. This is my submission to the #smartphonephotography challenge hosted by @juliank. Thank you for scrolling through my stories I hope you enjoyed it. Please upvote, feel free to drop me a line and tell me what you think. You can access my other posts on Steemit @vinceboisgard. You really keep your eyes open and seek for sights and moments. Brilliant capture, almost esoteric, hehe. Thanks, I got myself surprised too when I looked up on the spot. Sometimes, amazing thing are just where no one think of looking! Cool shot. Love how these little gems just pop up. Awesome you captured and shared it. And have also received a 3.50 percent upvote.